Objective: Middle players commences by selecting which winger to play a pass into. In the diagram the middle player chose the left side, play pass and make an attacking diagonal run to the side you played, Left winger receives the ball with the sole of the foot (Alligator) and rolls his first touch into to open central space to create balance in the attacking movement to play a pass into the right winger. Once the pass is played right the central player makes a diagonal attacking run to the right side of the court either overlappiing or in front of the receiving player. This decision needs to be worked out amongst the player to understand the difference between a run in front or overlapping. 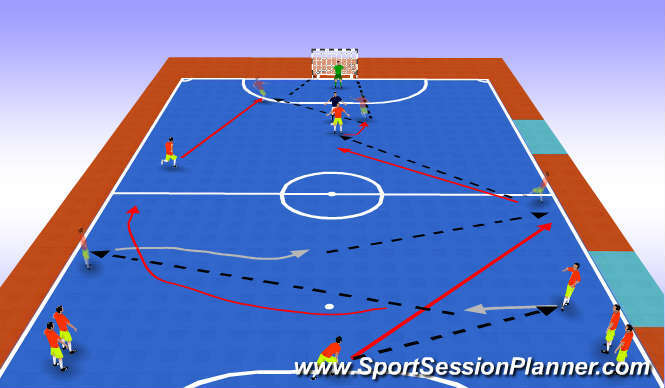 Coaching Points: Accuracy, pace and weight of pass, body stance and reception of the pass (Sole) 1st touch, into space. positive, neutral or negative? 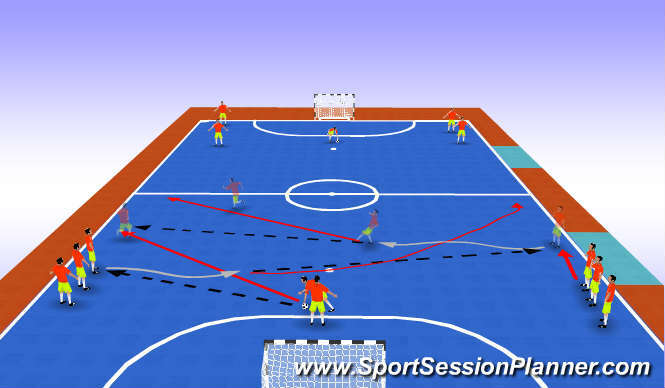 Acceleration after run, decision to overlap or make a diagonal run infront of the receiving player. Questions: What differences occure on the type of run the central player makes after pass. When would you use an overlapping run or a diagonal run in front of your receiving player? Coaching Point: Pivot to receive pass on furthest foot from the defender, receive with sole, Maintain body between the ball and defender. Roll the defender to shoot. Movement from supporting players, when? Timing/arrival, where? who makes what runs? Can the players off the ball look to break lines, runs to out number opponent, make the defender thing, inter change positions? Pivot, do I turn to shoot do I lay off or do I play a back post pass? Do I beat the goalie with a shot or dribble?